strengthening partnerships between the general public, the academic community and authorities in the course of decision-making on elimination of POPs sources, reduction of POPs adverse health and environmental impacts, sustainable waste management, including alternatives to incineration and zero-waste approach. For the purpose of choosing safe technologies with respect to hard domestic waste in Armenia we have made appeals to different ministries, the municipality and other organizations. Simultaneously were organized meetings with the representatives of the National Assembly, ministries (Mkheyan, A. Aleksandryan, Gevorkyan, Srapyan, Kosemyan) for the purpose of lobbying of the ecological approaches in the waste management and banning the use of dirty technologies. 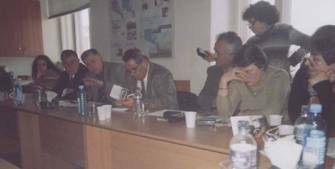 The Ministry of Urban Development by the support of OSCE on 30.11- 01.12.2005 organized a conference for the discussion of questions concerning the collection and disposal of the waste, and also the financing of this sphere of communal provision. At the conference among the other reports was presented the report of the Head of AWHHE Elena Manvelyan. One of the main tasks of the program carried out by the support of IPEP and UNDP is the increase of awareness among the population of the republic about the problem of efficient management of hard domestic waste (HDW), taking into account the precautionary principle, i.e. not to harm the human health and the environment. 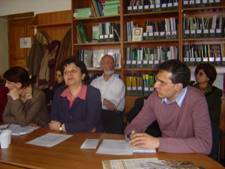 In the framework of the coalition of ecological non-governmental organizations was created a pushing working group that included 10 NGOs of the c. Yerevan . With the help of these organizations information material was spread both among the NGOs and the population. AWHHE became a member of the association “SOS Yerevan” that organized parliamentary hearings on the issues of nature protection and public health. During the hearings Lilik Simonyan, the executive director of AWHHE, made a speech about the impact of the improper management of the hard domestic waste on the health of the people. The organization takes an active participation in the formation of national concept collaborating with the international expert from Germany Helmudt Bernt. With this purpose there took place numerous meetings. The organization had several meetings with the international expert from Germany Helmudt Bernt. The result of these meetings was the organizing of the Round Table on March 30, 2006 to where were invited representatives from different sectors of society. The motto of the session of the Round Table was “Rationale Management of Hard Domestic Waste”. 25 persons participated in the session, including representatives of the ministries of Urban Development, Nature Protection, Industry and Trade, Yerevan municipality, international experts, businessmen, scientists and representatives of the interested NGOs. There was heard 5 reports, among which was the report of AWHHE member Emma Anakhasyan. The reporter from the municipality Mr. Eghiazaryan underlined the outmoded technical base and the lack of finance for the solution of the problem of HDW and presented the intended program based on the foreign investments. Professor from Teheran University Edwin Safary told about the experience on the Management of HDW in several foreign countries and his solution to that problem in Armenia . Mr. Poghosyan, a businessman, underlined the necessity of creating conditions for the development of monopoly in this sphere, the establishment of joint enterprises with the state structures equally taking risks, granting privileges to the representatives of a small business. All the reporters and participants with one accord mentioned the necessity of the raising awareness and self-descriptiveness of the population with the compulsory use of TV publicity. In the frame of the project video spot on waste incineration is created by Mushegh Minasyan, movie director and Gayane Sargsyan, script writer. Length of the spot is 3 minutes. To raise the self-descriptiveness of the people we widely use the possibilities of mass media. During the implementation of the project we published more than 4 articles in the central national newspapers: “Golos Armeni”, “Delovoy Express”, “Noyan Tapan”, “Azg” and others.